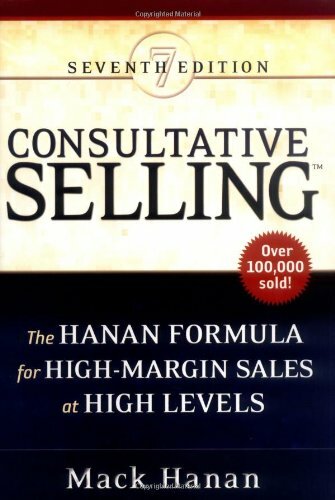 Amazon.com description: Product Description: "For more than two decades, Consultative Selling(TM) has enabled sales professionals around the world to achieve unprecedented success by helping their clients make more profitable business decisions. The Seventh Edition gives you the tools to continue bringing superior results to 21st Century organizations--and take your own career to a new level. Packed with strategic sales techniques, a step-by-step implementation guide, and case studies of companies--including IBM, Hewlett-Packard, American Airlines, and Motorola--Consultative Selling(TM) shows you how to develop long-term, continuing relationships with customer operating buyers, instead of just vending to purchasers. By selling improved customer profits, rather than products or services, you'll be a driving force in making your clients more competitive. Offering the same great features that have accelerated sales professionals' careers since its original publication, this brand new edition of Consultative Selling gives you the tools you'll need to truly maximize your success. The book still includes the same great features that have made it a steady seller for over two decades -- from a step-by-step implementation guide to case histories of methods and results in multiple industries. Packed with strategic sales tools, Consultative Selling(TM) is still a one-of-a-kind way for sales pros to maximize profits while helping their customers take their businesses to new levels."